XOXO Jes - Canadian Entertainment News: Tom Felton and Rupert Grint: Bromance Alert! Tom Felton and Rupert Grint: Bromance Alert! 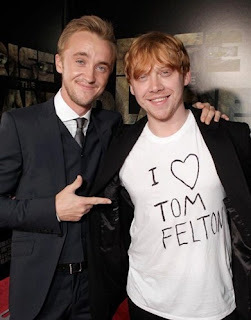 Rupert Grint showed up at the premiere of Rise of the Planet of the Apes, in which Tom Felton is a cast member, wearing this t-shirt. Such support, and such neat printing Rupert. $10 says he did not write that, he paid someone else to do it. I am not a huge fan of the Grint, but he is looking kind of cute in this photo. Just sayin.